File photo Despite higher gas prices, Memorial Day traffic is expected to be heavier than it has been in more than a decade. COLUMBUS — AAA expects near-record Memorial Day travel volume with 41.5 million Americans (1.6 million Ohioans) traveling at least 50 miles from home between Thursday, May 24 and Monday, May 28. This is an increase of 4.8 percent (4.6 percent in Ohio) and marks the highest Memorial Day travel volume since 2005. Automobiles: More than 90 percent of Ohio travelers (nearly 1.5 million), will drive to their destinations this Memorial Day, 4.6 percent more than last year. Planes: Nearly 89,000 Ohioans will fly this Memorial Day, 6.9 percent more than last year. With nearly 2 million additional travelers this year, INRIX, a global transportation analytics company, expects travel delays on major roads could be more than three times longer than normal. The busiest travel times will be late afternoon Thursday and Friday (May 24-25), as commuters mix with holiday travel. To avoid heavy traffic, travelers can avoid peak commute times in major cities. Instead, travel in the late morning or early afternoon, or plan alternative routes. With 36.6 million Americans driving this holiday, AAA expects to rescue more than 340,000 motorists at the roadside this Memorial Day weekend. Dead batteries, lockouts and flat tires will be the leading reasons AAA members will experience car trouble. Before hitting the road, motorists can get road-trip ready by having their vehicle battery tested, checking tire condition, and ensuring their car is up-to-date on routine maintenance. Be prepared for emergencies with a mobile phone and car charger, flashlight with extra batteries, first-aid kit, basic toolkit, and drinking water and snacks for all passengers. While road trippers will pay higher prices at the gas pump this year, travelers can expect some relief in their wallets when paying for airfare, car rentals and most mid-range hotels, according to AAA’s Leisure Travel Index. Airfares are 7 percent lower than last Memorial Day at an average of $168 for a round-trip flight along the top 40 domestic routes. At $59, the average daily cost of a car rental this Memorial Day is the lowest rate in the past four years and 11 percent cheaper than last year. AAA Three Diamond hotels are trending 14 percent less expensive than last Memorial Day, with an average rate of $186 per night. AAA Two Diamond hotels are 7 percent more expensive than last Memorial Day, with an average rate of $151 per night. 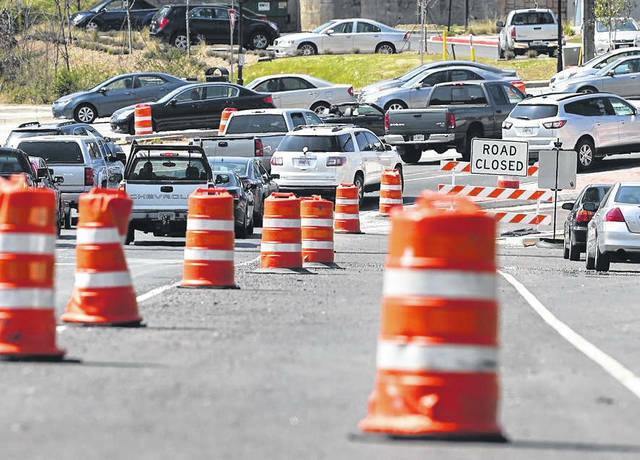 https://www.morrowcountysentinel.com/wp-content/uploads/sites/29/2018/05/web1_Traffic-generic.jpgFile photo Despite higher gas prices, Memorial Day traffic is expected to be heavier than it has been in more than a decade. Kimberly Schwind is the senior public relations manager for AAA Ohio Auto Club.